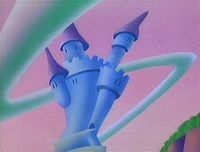 Cramalot Castle is a large castle seen in The Super Mario Bros. Super Show! episode "King Mario of Cramalot". Cramalot Castle resides on a hill above the village of Cramalot, possesses a slightly warped appearance and is light blue in coloration. Surrounding Cramalot Castle is a Trouter infested moat and the Forest of Perpetual Night and Terrible Dangers. Cramalot Castle, like most castles, possesses a throne room, dining room, draw-bridge, it also has a dungeon, the spike-covered ceiling of which can lower; holes in the walls of the dungeon also pump in water, flooding the place. This page was last edited on February 17, 2018, at 02:45.